PHUKET: The driver of a tour bus illegally carrying passengers while still fitted with red license plates – and which killed a motorcyclist in a collision on Sunday – has had his license suspended for three months and the bus operator has been fined B50,000, transport officials have confirmed. The “red license plates” are issued by the Land Transportation Department so that unregistered vehicles can be moved on public roads, and are specifically marked with the words “Use for sale or repair”. “The bus, which belongs to Racharot tour company, had been recorded with the Transport Dept in July 2016 to be used for land transportation, but the bus had yet to be registered and issued license plates,” Prapai Suankul, Senior Policy Specialist at the Phuket Land Transport Office (PLTO), told The Phuket News this morning (Sept 14). The accident occurred in front of Hongyok Bumrung School at about 4pm when Korean tourists returning from Phang Nga to Phuket Town were witness to a horrific accident on Thepkrasattri Rd in Mai Khao when the bus they were travelling in struck and killed 47-year-old local Baan Yid, Mai Khao, resident Noppadon Chairab. “It is illegal to operate non-registered vehicle so the bus operator was charged with the maximum fine of B50,000 for operating non-registered vehicle and not paying road tax,” Mr Prapai said. “We recorded the offence for future reference and also warned the operator not to use non-registered buses for transportation again,” he added. 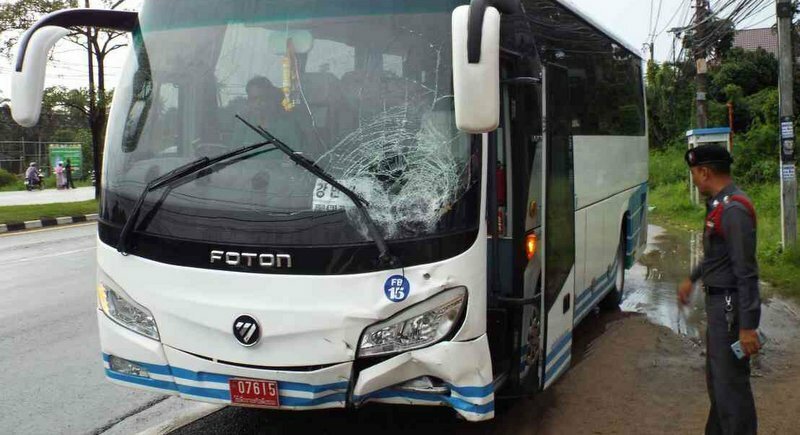 After the accident, bus driver Tanu Longsamud, 38, from Songkla told police that the motorbike suddenly cut in front of him while the driver was making a u-turn. However, he now faces a charge of reckless driving causing death. “But since he was operating an unregistered bus, his license has been suspended for three months while he his charges are heard in court. If he is found guilty, his license will be terminated,” Mr Prapai confirmed. Tha Chatchai Police reported stopping another Racharot tour bus operating with red license plates at the police checkpoint onto the island yesterday evening (Sept 13). “We will investigate this incident, too,” Mr Prapai added. Well Samantha, that is the value of a human life in Thailand. Numerous are convictions of thai hit men in thai courts after admitting they got paid 50,000 thb for killing someone. 3 months suspension and 50,000 baht fine for killing someone. No wonder roads in Thailand are amongst the most dangerous in the world, and getting more dangerous. There's no real punishment or deterrent if you kill someone.